! This guide was updated on 01/02/2018. Added reference to RasterStacks, and links to a new guide showing how to use them. This is part three of my guides for getting climate data and working with it using R. If you missed part one or part two, you can go back and read them, but it is not necessary to have worked through them to follow this guide (although it may help!). WorldClim is a collection of global gridded climate data "layers", which include temperature (mean, max, min), precipitation, solar radiation, wind speed and water vapour pressure. Unlike CRU datasets which contain data for every month between 1901 and 2016, WorldClim contains monthly averages for the period between 1970 and 2000. However, the resolution of WorldClim is much higher, with grid squares representing an area ~1 km2, versus the ~55 km2 resolution of CRU data. Both datasets are based on weather station data. WorldClim data is also stored in a different file format. You might remember that CRU data came as NetCDF files, which are basically large data arrays. WorldClim data on the other hand can be download as GeoTiff files. These are essentially image files that contain additional metadata - such as map projection and coordinates. Ultimately, the dataset you choose to work with will depend on the application, what kind of data you need, and personal preference. CRU data is better for looking at long-term data and identifing trends, while WorldClim might be better if you just want to know the typical climate conditions for an area. Of course, WorldClim and CRU are not the only climate datasets out there, there are many, many more! But, since most datasets tend to provide either NetCDF or GeoTiff files, you should be able to use these guides as a basis for working with other datasets. For this guide, we'll look at average temperature. 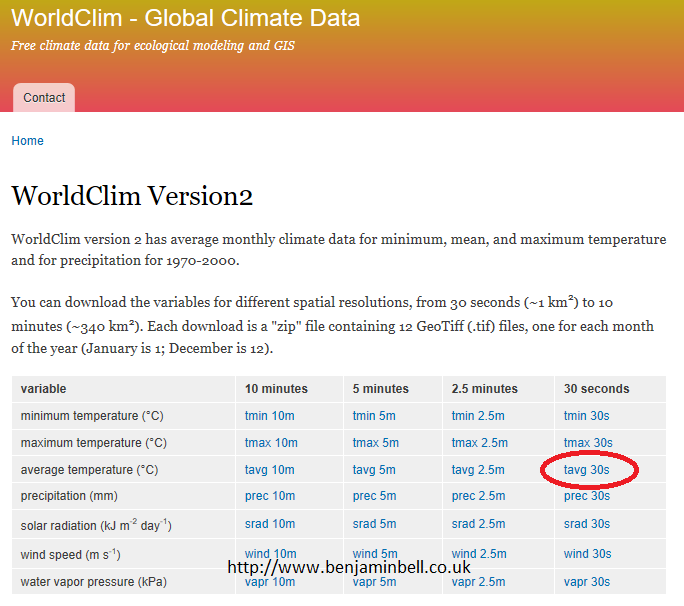 The latest version of WorldClim datasets is version 2.0. This includes files for "current" climate conditions (1970 - 2000), the previous version 1.4, also contains data for past climate (6000, and 20,000 years ago! ), and future climate scenarios. For detailed information about the dataset, check out the associated research paper. The .zip file will contain 12 separate files named "wc2.0_30s_tavg_01.tif", "wc2.0_30s_tavg_02.tif" etc. Each file contains data for one month with 01 being January, 02 February etc. Extract the files to a new R project folder, e.g. "WorldClim". For this guide, we are going to load all the data into R by creating separate raster objects: RasterLayers, for each month. Update: You can also load all the data into R at the same time using a RasterStack. Have a look at this guide to find out how. This provides some information about the file. For example, we can see how many data points there are (ncell), the coordinate system used, and the min/max values of the data. The temperature data is in degrees Celsius (℃), and we can see that the coldest average temperature in January was -46.9℃ somewhere in the world! To extract data for your sample sites from WorldClim datasets, we'll use the same commands as we did for CRU data. Even though the raw data files are in different formats, loading them as raster objects in R means we can manipulate them in the same way. For this example, we'll create a data frame with the sample site coordinates. Here, we created three vector objects containing our data, then we created the data frame object by telling R which vectors to use to construct the data frame. The vectors will become columns in the data frame. Specifying row.names="site" tells R that the "site" vector should be used for the row names in the data frame. To check that the data frame was created as you intended, simply type "samples" into the R console. In the previous guide we extracted all the raw data to a new data frame using one command. Since our WorldClim data is stored in separate RasterLayer objects, we will instead "build" our new data frame by extracting each month separately, adding this data as a new column to the data frame. First, we duplicated the "samples" data frame, and called it "temp.data" - this is the data frame that will contain our extracted temperature data. extract(temp1, samples) tells R to extract the data contained in the "temp1" object, using the coordinates in the "samples" object. temp.data$Jan tells R that the extracted data should be added as a new column named "Jan" to the existing data frame "temp.data" - Then we simply repeat for each month. The data frame should now contain average temperature data for each month for your sample sites. Update: With RasterStack objects it is possible to extract all the data in one command, rather than "building" the data frame. This guide shows you how to do it. So why use RasterLayers instead of a RasterStack? Well, if you only want to look at a small number of files, it might be simpler to create a RasterLayer. You also might want more control over the individual layers in a RasterStack, or want more ways to manipulate the data (e.g. such as creating the seasonal data), so creating separate RasterLayers might be preferable. The beauty of R is there is almost always more than one way to do something, with different options to suit different applications. It is important when learning R to be aware of different approaches to working with data, to improve your understanding of the language. So that's how you can extract data for your sample sites from WorldClim datasets. You could now perform different kinds of analysis on the data, or plot some climate graphs. Refer back to part two of this guide for help. For example, you could calculate mean annual temperature for your sites by using rowsMeans() e.g. Since the resolution of WorldClim datasets is very high, its possible to plot some good looking climate maps without too much work! So, lets make some climate maps - first, we'll create a colour scale for our temperature data - you are free to use any colours you like for your maps, so why not experiment creating different schemes? try ?colorRampPalette and ?colorRamp in the R console for help. The number in brackets after "tempcol" tells R how many colours to "create", using the colours defined in the "tempcol" object as its palette. i.e. it blends these colours together. So, tempcol(100) creates 100 colours which will create a "smooth" colour scale. You could also create a map of the January temperatures for the UK by defining the boundaries of the plot, using xlim=c() and ylim=c() e.g. But now the colour scale looks a bit misleading. This is because R automatically sets the scale to the min and max values that you are plotting, so our colour scale no longer makes sense. It is possible to override this using zlim=c() e.g. Now this map looks more realistic! You can also use zlim=c() to define the range of values you want to plot. Lets re-plot the world map, but this time we'll just plot the areas with temperatures above 25℃ in August. We'll also use the inbuilt colour scale "heat.colors". Could be useful for planning your next holiday? - But, perhaps it is now a bit hard to see where these places are. Lets add a simple outline of the world using the "maps" package - install.packages("maps") to install it. You may have noticed that it can take R quite a long time to plot maps using the WorldClim dataset (unless you have a very powerful computer!) - this is because, as their name implies, they contain data for the whole world, so when loaded into R, they use a lot of memory. If you're only interested in a small part of the world, it makes sense to subset the data before you plot it. 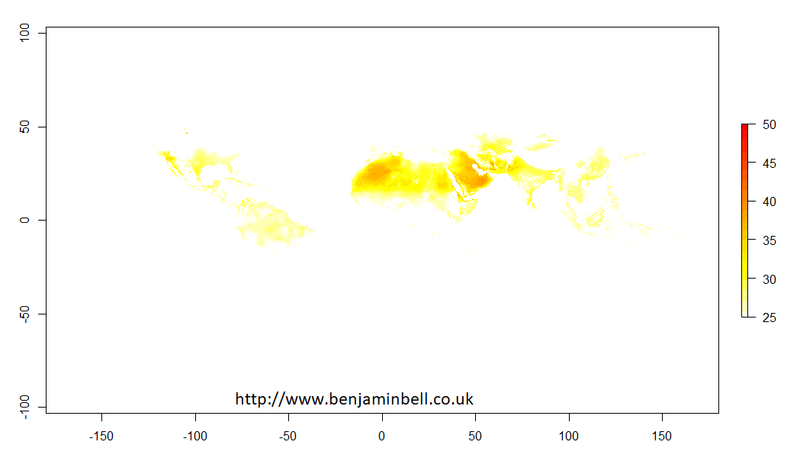 We did this in part one of the guide when we plotted a map of the UK with the CRU dataset. Lets take a look at another part of the World. Most of my research has been focused in Morocco, so lets look at temperatures there. 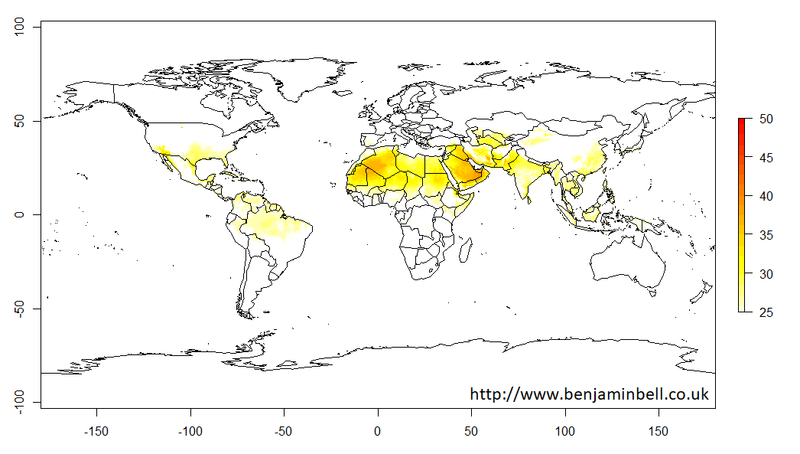 First, we'll define the extent() and then use crop() to subset our WorldClim data to Morocco. When you plot the these new objects, it should be much quicker. Lets plot a map of August temperatures in Morocco. We'll also add some place names for reference points. 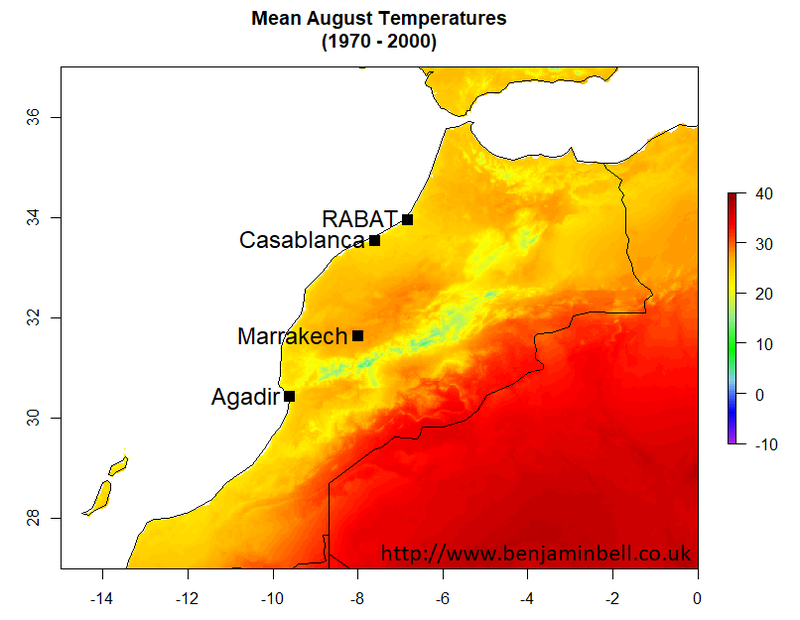 From this map we can easily see the temperature range across Morocco during August. Looks like fairly nice summer temperatures for most of the country, getting much cooler in the mountains, and much hotter along the southern border with Algeria. If you wanted to quickly know the temperature value for any point on the map, you could use the click() command from the raster package. After inputting the command in the R console, simply click anywhere on the map, and the value of where you clicked will be output to the R console. To stop clicking, press escape on the keyboard, or "stop" on the menu bar. 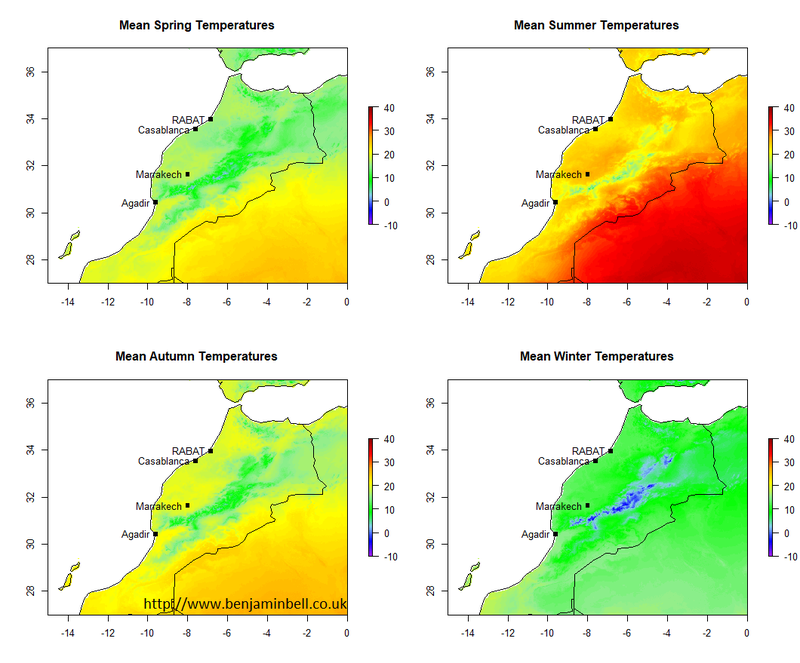 Using the subsetted WorldClim data for Morocco, we can easily create seasonal temperature maps. First, we'll create the seasonal data. 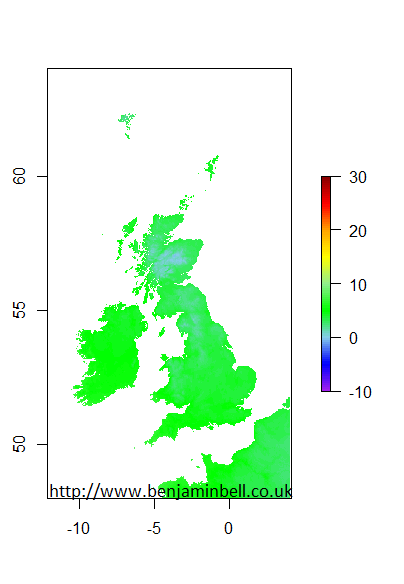 In this code we are simply creating new raster objects which contain the average temperature values for each season. And that's it! 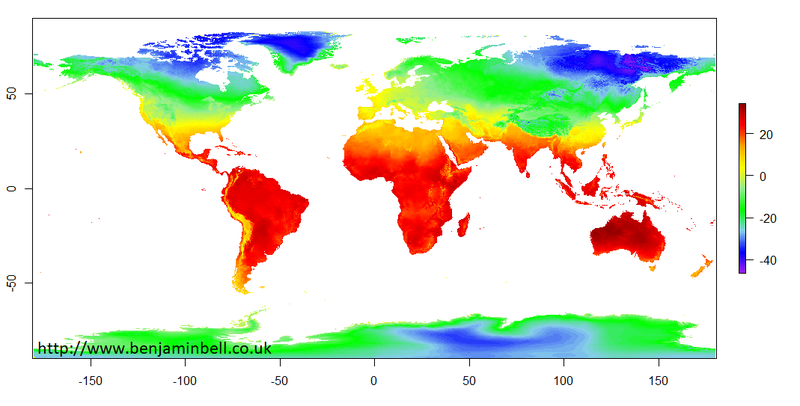 - Making climate maps is really easy and straight forward using WorldClim data and R. You can use what you've learned in this guide to create all kinds of climate plots for anywhere in the world. Perhaps you want to plot a figure which has all 12 months of data on it instead? 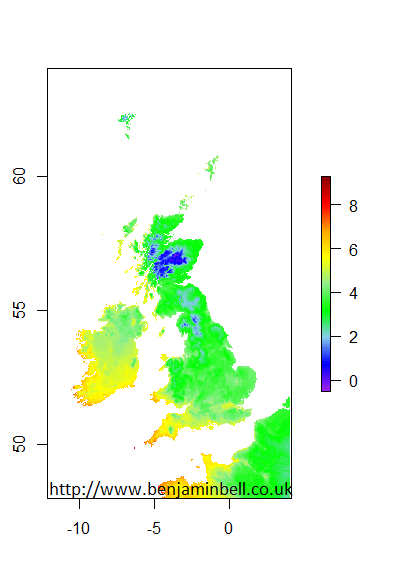 Or perhaps you want to plot a map which compares maximum and minimum temperatures for an area? - Just download the appropriate datasets from the WorldClim website. Update: I've now created a guide to show you exactly how to do this. Check it out! Of course, its possible to create the same plots using other climate datasets, including the CRU data - although they might not look as nice since the resolution of the data is lower. However, its possible to interpolate the data to make the maps look much better. This will be the subject of a future guide! Extracting CRU climate data - Part 1 of this guide! Working with RasterStack objects and WorldClim Data - Part 4 of this guide!